Anita is an avid traveler who enjoys seeing new places, learning the history firsthand, enjoying the food and meeting people. The most significant part of travel for her is the encounters with people, including herself! Her work has appeared in Women'Synergy, Medulla Times, and the Albany, NY, Times Union. On the train from Palermo to Agrigento, I fumble around in the steadily filling train, trying to figure out what to do with my bag. The Italian trains, excellent in all other respects, lack enough room for luggage. I am left contemplating the rack about the seats, a good six feet off the floor. Although I travel light, lifting my bag high enough to clear the front lip of the rack is a struggle. The man in the seat behind mine pops up. He is about 5’3” and built the way a barrel would be if it were constructed from muscle and sinew. He has gray hair, and skin leathered and creased from sun and wind. He is dressed in a suit of rough gray wool. He wears a plaid open-necked shirt. He grabs my bag and lifts it easily onto the rack, far above his head. After he has finished, he asks me, partly in English but mostly in Sicilian, where I am from and where I am going. When I tell him (partly in Italian but mostly in English) that I am on my way to Agrigento, his smile gets wider, and he tells me that Agrigento is beautiful (e bella, bella). 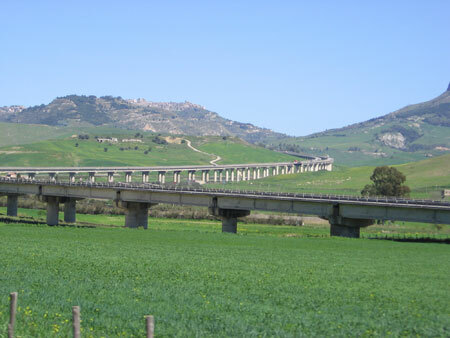 The train leaves Palermo and eases into terrain steadily more rural. I gape out the train windows and photograph every other field. As I always do when I am in a country with a primary language other than English, I wonder what it would be like to have a stream of foreigners who do not speak English wandering through my neighborhood, exclaiming at the sights and photographing everything, in need of assistance they don’t have words to ask for. He puts one knee on his seat so that he can look out the train window and talk to me over the back of my seat at the same time. He points out a mountain above a village. 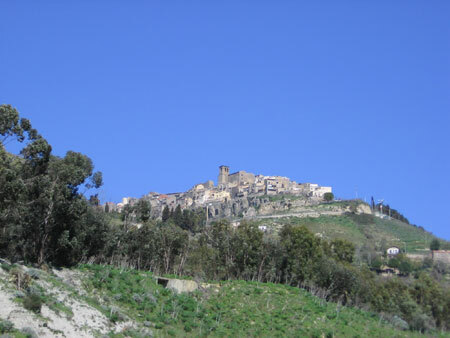 Even though he is speaking in rapid Sicilian, I understand him to say that this is the mountain of his home. The village, he tells me is Cammarata. Home. I watch as the couple leaves the train, then see them again through the window, walking across a set of tracks to reach the station. They have been joined by an elderly man and are deep in conversation, perhaps about all they did in Palermo, or about the odd foreigners who lug so many of their possessions with them on their journeys, to have a bit of home, perhaps. The train begins to move, and I lose sight of them.